This route forms just more than half of the third stage of the 2013 Tour de France and in my view by far the most interesting part of that stage. From the square in Piana village head north on the D81 past the classic old hotel, Les Roches Rouges. The next few kms are as per the picture. There are many photo opportunities along this narrow stretch and it made magnificent TV for the Tour. After descending 16km to the edge of Porto the day's climbing commences. Off to your left is the Golfe de Porto which stays with you as you summit the Col de la Croix at 272m. 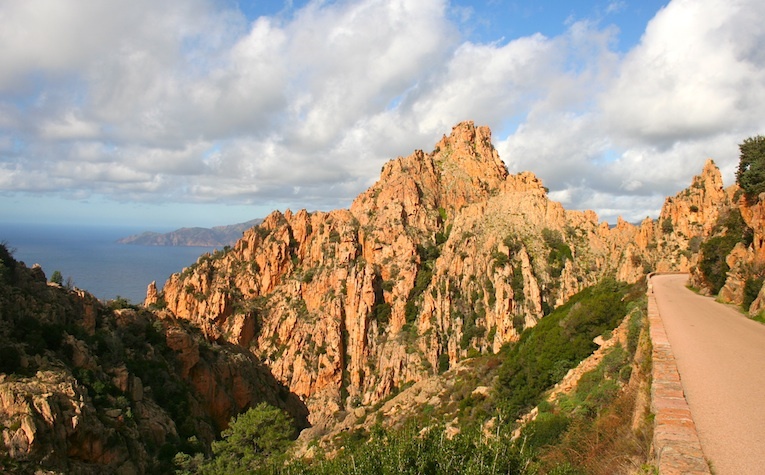 The new view is the Golfe de Girolata and the natural reserve of Scandola beyond. This Col is famous as it's the start of the foot path which apart from boat, is the only way to access the superb and isolated seaside village of Girolata (a 2hr plus walk in). Local legend has it that a retired French Legionaire runs in and out with the post on a daily basis six times a week! The next target is the Col de Palmarella at 374m some 10km on from Croix. The panoramas from both Cols are truly magnificent and well worth a stop for pictures and/or just to take it all in. After the Palmarella the road drops into the start of the Fango Valley. Over the bridge and back inland for the final climb of the day, the Col de Marsilino, 443m. Up ahead the road appears to disappear but don't worry there is a way through the Grand Barriere. The main climb of the day with a maximum gradient of 11% and with a couple of kilometres before the Col where it will be plus 7%.